Another gloomy day, dry but poor visibility. 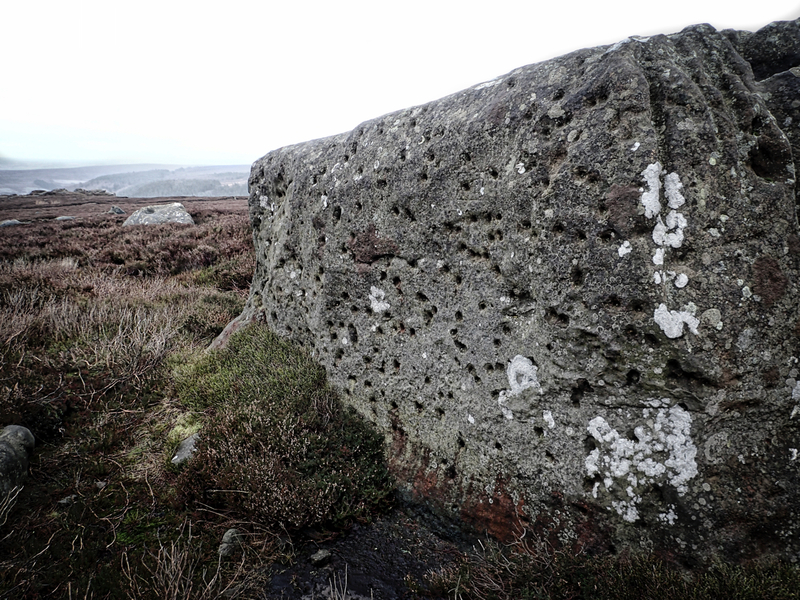 I came across this large sandstone boulder on Ingleby Moor pitted with small holes, particularly on the north-east face. Stone Age rock art? Or a gamekeeper taking pot shots? Google comes up with a clue. There is an assumption among the rock climbing fraternity that they’re bullet holes. The Modern Antiquarian also comes to the same conclusion after talking with the local keeper. Apparently, the military did use the stones for target practice during the Second World War. I wondered where the shooter would have been standing. The next high ground north-east of the boulder is about 1,000 metres away. The effective range of the standard WW2 rifle, the Lee Enfield, is 500-600m although a bullet could travel much further, losing accuracy and momentum. So I guess it’s feasible. I also wondered what happened to the bullets bouncing off. I scraped the surface of the peat but didn’t find anything, maybe I need a metal detector.